Item # 275223 Stash Points: 3,995 (?) This is the number of points you get in The Zumiez Stash for purchasing this item. Stash points are redeemable for exclusive rewards only available to Zumiez Stash members. To redeem your points check out the rewards catalog on thestash.zumiez.com. 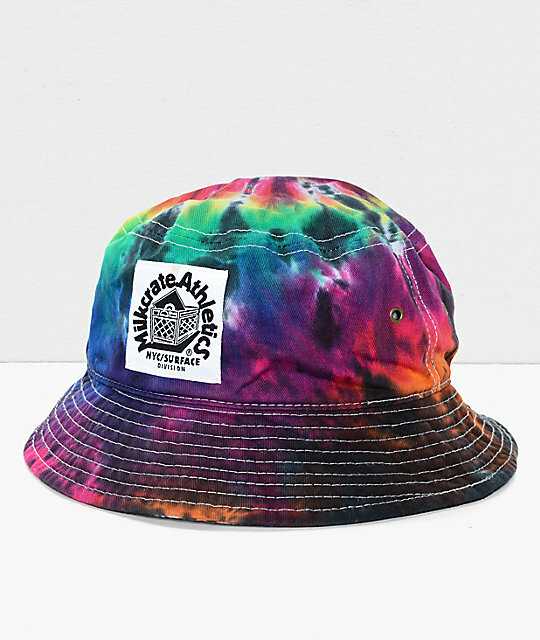 Add suave psychedelic styling to your wardrobe with the Milkcrate Tie Dye Bucket Hat. A classic bucket hat design that features a brand logo patch, tie dye colorway, and an all around lightweight comfortable cotton construction. Milkcrate had found it's roots in NYC streetwear fashion and the Tie Dye Bucket Hat is testimony to the raw fashionable culture. Tie Dye Bucket Hat by Milkcrate. Lightweight and comfortable cotton construction. All over tie dye design. Wide soft brim for shade. Metal eyelets at the sides.